You’ve had the whole summer to perfect your grilling strategy—to learn your grill’s hot spots, to know which advice to take, to cater to the cooking preferences of each member of your family. It’s almost Labor Day: Are you qualified as your family’s “Steak Whisperer”? Whether you are or not, we’ve found a pair of smart grills that can help you transform the art of backyard grilling into a science. 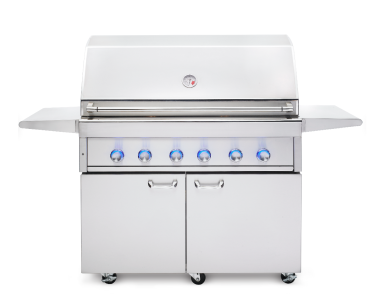 Downey, Calif.-based Lynx Grills launched its SmartGrill in early 2015, as an advanced version of its high-end food preparation systems. Designed to remove any and all uncertainty from the outdoor cooking experience, the SmartGrill itself asks what you’re making and how you’re making it, turning the heat up and down when needed. It also learns your preferred cooking times to ensure you’re getting that medium-rare steak you want every single time you grill. Better yet, you can download the SmartGrill app for iOS and Android and you’ll get a text alert when it’s time to flip those burgers or plate that steak. Of course, such sophisticated technology comes at a fairly steep price: The 30-inch SmartGrill starts off at $6,000, while the 42-inch version runs about $9,000. But Lynx products clearly cater to the serious foodie who settles for nothing less than grilling perfection. For those of us who want a nicely grilled piece of meat without having to take out a second mortgage, Palette Home, Inc. has developed the Cinder, a countertop grill that uses Bluetooth Low Energy to communicate with an iOS app for precise cooking instructions. Cinder monitors its temperature to keep the heat uniform across its surface. After selecting what you are cooking and exactly how you want it cooked via the app, feel free to walk away as it slow-cooks your steak (or fish or chicken) to perfection. It can also stir-fry vegetables and even caramelize onions. Plus, the Cinder’s electric cooking plates are easy to remove and clean. The only problem? The Cinder isn’t available just yet. Priced at $249 for preorder, it’s scheduled to ship in 2016. Oh well—there’s always next summer.